The quality of groundwater is highly variable and groundwater contamination may be caused by man-made or natural sources. Integration of borehole-geophysics logging with water-quality sampling provides a more complete picture, whether the objective is to develop a water-supply well or remediate a contaminated aquifer. Wells are the access points to the groundwater system, and knowledge of their construction and condition are important whether they are being used for groundwater supply, monitoring, or remediation. The location and condition of casing and screen can be rapidly evaluated with geophysical logging. Geotech offers instruments for recording and analyzing measurements of the geophysical properties of wells and boreholes. Gamma logs record the amount of natural gamma radiation emitted by the rocks surrounding boreholes. Gamma logs, also called gamma-ray logs or natural-gamma logs, are the most widely used nuclear logs in groundwater applications. Common uses are identification of lithology and for stratigraphic correlation. 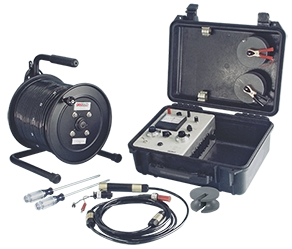 The Geotech Gamma Ray Logging System is used in exploration for uranium, potash and base metals as well as for petroleum and groundwater. The system identifies lithologies and stratigraphic correlations in boreholes, cased or uncased, liquid or air filled. 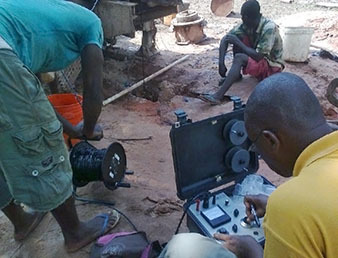 For petroleum and groundwater exploration, the system provides information on the sequence of rocks in the borehole, and it can also be used to locate nonradioactive substances such as coal. Resistance logs record the electrical resistance from within a borehole to an electrical ground at the surface. Resistance logs are used to determine lithology and location of fractures. 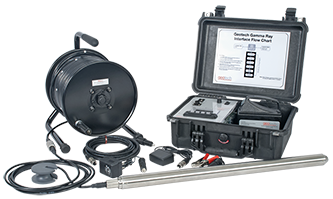 The Geotech Borehole Resistivity System is a rugged, portable, hand-operated downhole logger which measures both apparent resistivity and the natural self-potential (SP). Applications include mineral exploration, subsurface mapping (isopachs), locating fresh and salt-water bearing information; lithologic and structural correlation between wells, and well construction.